Gerber Custom C475 ebony wood handle, high speed steel blade that is near mint, sharpened with light scuff marks. The knife is 9-5/8" overall. The original leather sheath is near mint. The leather sheath that comes with this knife is the first design. They have a unique shape that holds the knife in the sheath for normal carry but if you need more protection there is still a snap strap to completely lock the knife in. Custom designed to meet the rugged demands of today's outdoorsman, these superb cutting tools blend ultramodern, functional design, and skilled Gerber craftsmanship and manufacturing techniques. Extra-strong blades are precision ground to a razor sharp, double-wedge shape and boast a super-hardness of Rockwell C60-62. Special industrial hard-chrome plating keeps these high speed tool steel blades bright and stainless through the demanding use for which this series was designed. There were six blade designs to choose from with this ebony wood handle. 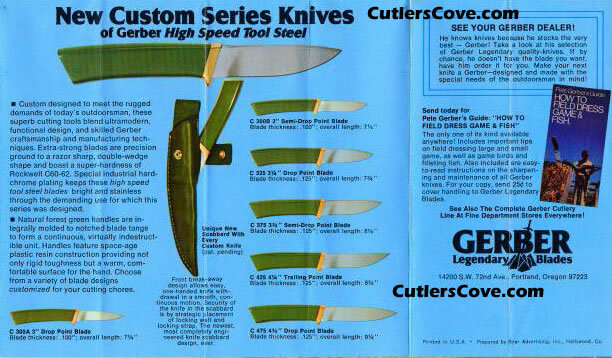 According to Levine's Guide to Knives and Their Values 4th Edition Al Mar designed these while he was at Gerber. Made 1976-78. Gerber Custom C475 ebony wood handle, high speed steel drop point blade that is near mint, sharpened with light scuff marks. The knife is 9-5/8" overall. The larger the model number in this series the wider and thicker the blade. The original leather sheath is near mint. The leather sheath that comes with this knife is the first design. They have a unique shape that holds the knife in the sheath for normal carry but if you need more protection there is still a snap strap to completely lock the knife in. The largest knife in the series. Gerber Custom ebony wood handle, high speed steel trailing point blade that is near mint, sharpened with light scuff marks. The knife is 9" overall and is not marked with a model number. It is marked with four XXXX near the tang and the Gerber mark is about in the middle of the blade. It maybe a C425 as the C425 is the only one shown with the trailing point blade. The original leather sheath is excellent, marked C375 and fits the knife fine. The leather sheath that comes with this knife is the first design. They have a unique shape that holds the knife in the sheath for normal carry but if you need more protection there is still a snap strap to completely lock the knife in. Of all the Gerber Custom knives we have had over the years this is the only one marked this way. The knife is first class in anyway you measure quality, fit or finish. 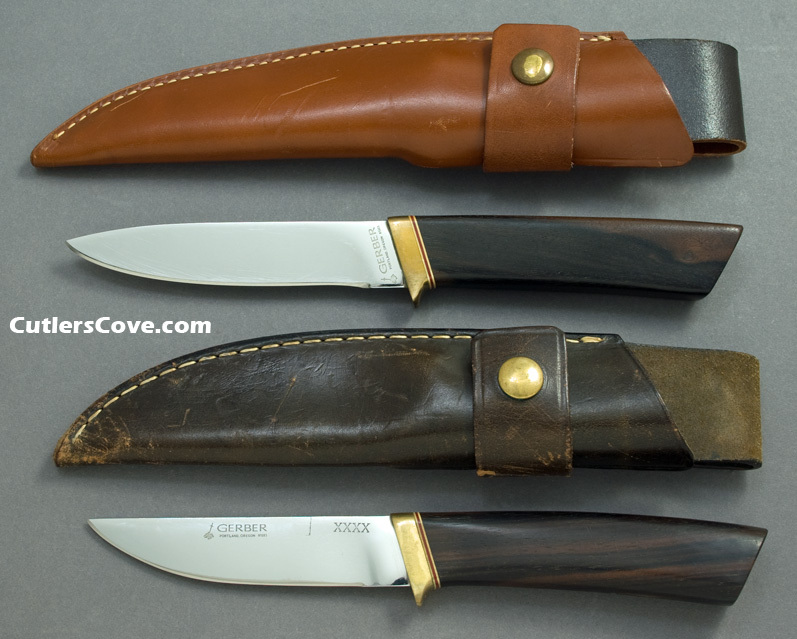 Bottom knife and sheath in photo above. 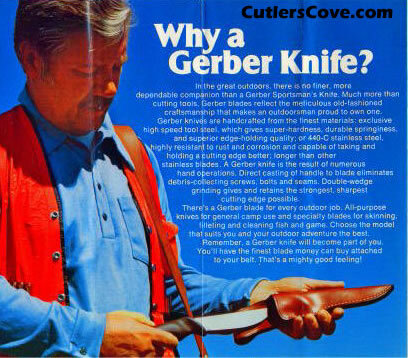 Below copy of original Gerber brochure is circa 1975.